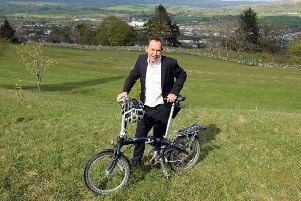 A man who can often be seen handcycling around Burton-in-Kendal is undertaking a gruelling challenge to raise money for a disabled sports charity. John Mackness, 71, who broke his neck whilst playing rugby at the age of 20, will be cycling 320kms over five days around the island of Bali to support the work of REGAIN, a charity which aims to improve the independence of people who become severely paralysed as the result of a sporting accident. John, who lives in Burton-in-Kendal, has been handcycling since 1985 when the sport was just beginning. He said: “I broke my neck whilst playing rugby at university. The scrum collapsed on me andI was unconscious. “I had no idea what had happened until I woke up in hospital. After two weeks I was sent to a specialist spinal unit in Sheffield. “I was totally paralysed for three months then there was a twitch of movement in my left wrist that was the beginning of something. I was soon on sticks and walking and kept on recoverinfg for six months. “I had an invalid carriage and managed to complete my degree in mining engineering. Johngot married and went to live in Brazil but at this time he was walking with a stick. The couple stayed there until 1982 when they came back to England. In 1984 he went to be a lecturer at Lancaster University where he stayed until 2010. John said: “I was falling over more and more so the physio took me to one side and said it would be best to sit in a wheelchair. “I can still stand but I don’t walk any more. In 2010 we did our firs t charity ride in Northern India.This is our second charity ride. We also did a triathlonlast year where my wife and I did bits of it each, to raise money for St John’s Hospice. There are four tetraplegics’ taking part in the Bali ride as well as able-bodied people who also cycle who may be carers or partners. Altogether there are 50 cyclists taking part. John said: “It’s a bigger ride and part of it is showing the Bali people what we can do. The Bali Sports Foundation organise the hotels and so on and are intent on getting a few Brits over there. I’m 72 next month and the oldest guy is 76, the ride is not just for young people. Handcycling is fantastic for independence and John can get into the handcycle himself and go out for a ride,. cycling 10-15 miles a day. He said: “I’m feeling fitter and it’s good vascular exercise as well as being out in the fresh air. It develops your upper body strength and you can travel further than on a normal cycle. Everybody waves at me when they see me and I nod at them. It is daunting facing the challenge, but sometimes the actual travelling an dstaying in hotels is more difficult. “I was only 20 when my accident happened and it’s all thrown up in the air, it was catastrophic. You have anger and frustration but then you realise you make the best of what you can. Indonesia covering a total of 320km. Regain Sports Charity is inviting cyclists of all abilities to take part, including tetraplegics and their carers. There is someone in nearly every town in Britain who has broken their back while taking part in sports activities, and every eight hours someone suffers a catastrophic spinal injury. Visit www.justgiving.com/fundraising/John-Mackness1.to sponsor John in his quest.